Current Page: Home > Tips&Tricks > How to rip and convert DVD movies to AVI MPEG WMV FLV 3GP video files? How to rip and convert DVD movies to AVI MPEG WMV FLV 3GP video files? Wanna watch DVD movies on Windows media players or portable digital players? Afraid of scratching of DVD movie discs and wanna make a copy for backup? You may have such this and that requirements. mediAvatar DVD Converter shows you how to rip and convert DVD movies to AVI, MPEG, WMV, DivX, MP4, H.264/MPEG-4 AVC, RM, MOV, XviD, 3GP, MP3, WMA, WAV, RA, M4A, AAC, AC3, OGG, and many other video/audio formats, enabling you to put DVD movies on almost any multimedia devices. 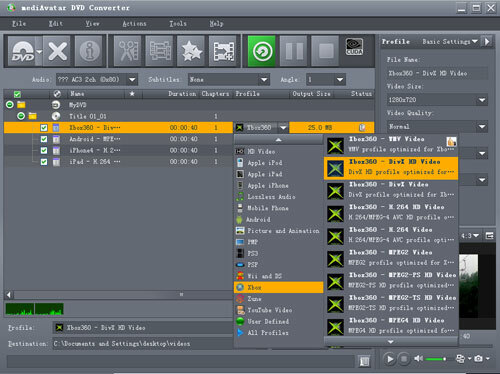 Besides ripping DVD, this DVD converter also can clip, merge, split videos, add transitions effects, adjust video image effects and do many other customizations. 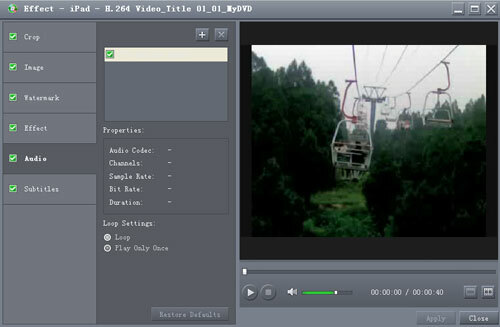 We would like to show you how to rip DVD movies to video files and how to edit videos step by step. Insert DVD movie disc, then click on "Add File(s)" button on the toolbar or "File > Open DVD" menu option to load the DVD disc you insert. You can also drag and drop IFO/ISO files onto the main program window, or click "File > Open ISO Folders…" or "File > Open ISO Files…" menu option to load the IFO/ISO files you want to convert. Check one or multiple titles, click "Browse" button to choose the output folder for saving the converted files, and click to open "Profile" drop-down list below the file list to choose the output format you want for the checked items. 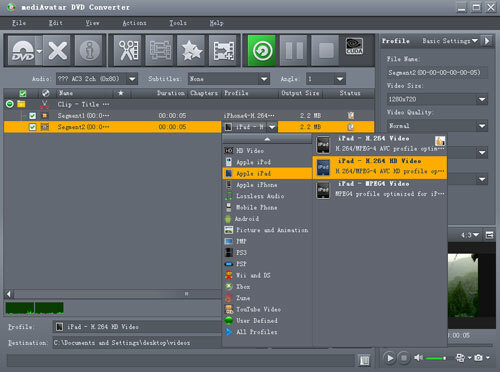 As you can see, mediAvatar DVD Converter sorts the conversion profiles by common use, devices and user-defined. 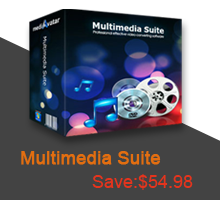 If you have multiple multimedia devices and want to play this DVD movie on all of them, you can add multiple output formats for each file, then convert them at one go. Repeat the above step to add as much output formats as you want. If you want to output definite-size file that fit your device most, you can use the built-in bitrate calculator. 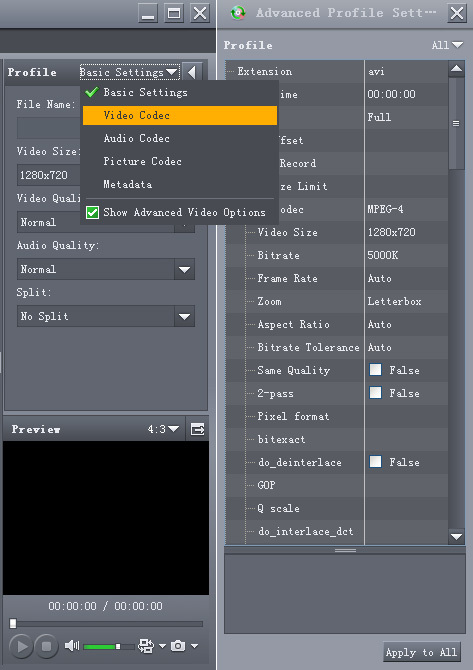 Click "Tools > Bitrate Calculator" menu option, enter the file size you want in the dialog that opens, then the tool will calculate its corresponding video bit rate, click "OK", then the output file size you want will be displayed in the file list. 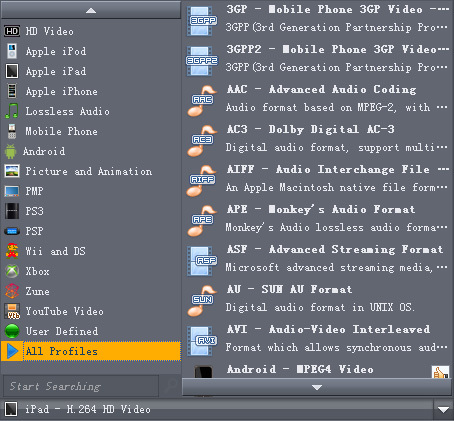 To help facilitate away-from-keyboard conversions, this DVD converter software has the ability to automatically shutdown, stand by, or hibernate the computer or close itself after conversions are finished. To make use of these options, look under the "Actions > Post Task Actions" drop-down menu. You can check the CPU usage below the file list. To make full use of your CPU or customize the CPU usage or conversion speed, go to "Preferences > Rip" tab by clicking "Preferences" button beside the CPU usage t to set the CPU core number for converting videos, or if you have GPU-enbaled CPU, you can enable NVIDIA GPU acceleration to speed up your DVD ripping. Choose the DVD title you want to clip from the file list, click "Clip" button on the toolbar to enter "Clip" window. 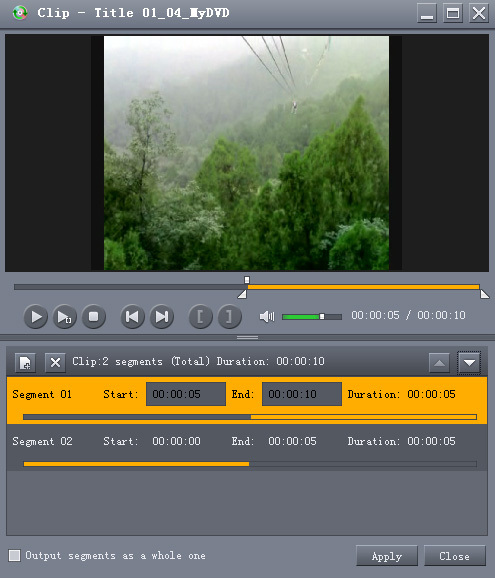 Click "New Clip" button to add a new segment into the segment list, then set its start time and end time by entering the values in the boxes or dragging the sliders in the player. Repeat this step to extract any number of segments you favor. Click "Move Up" or "Move Down" button to adjust the order of these segments. If you check "Output segments as a whole one" option, then all the segments in the list will be merged into a single file after you click "Apply" and "Close" buttons to return to the main window. You can freely choose different output formats for every segments. Select the titles or clips you want to merge in the file list, and click "Merge" button on the toolbar to merge these into a single file. 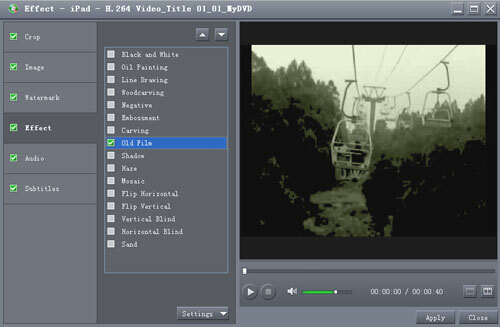 Besides these, this DVD converter allows you to crop video screen size, add subtitles/soundtracks/effects/watermarks to the outputted movies.To do this, choose an item from the files list, and click "Effects" button on the toolbar to enter "Effect" window. Go to the "Crop" panel. 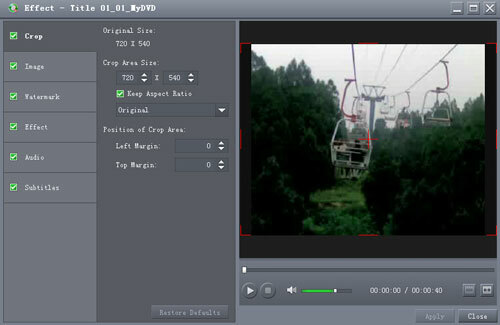 Set the "Crop Area Size", "Left Margin", "Right Margin" options by entering their values respectively, or dragging the lines on the image in the right player. 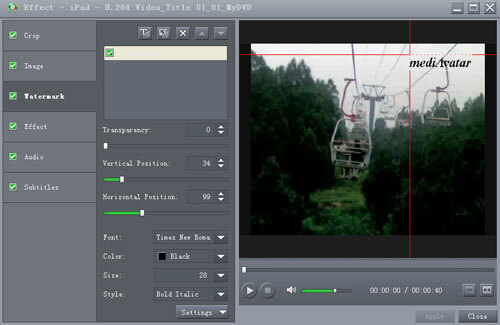 Check "Keep Aspect Ratio" option, or choose the aspect ratio you want. Go to the "Watermark" panel. Click "Add Text Watermark" or "Add Picture Watermark" button above the watermark list, enter the text or choose the picture you want, then adjust the settings of the watermark. You can add as many watermarks as you want. Go to the "Subtitles" panel. Click "Add Subtitles" button above the subtitle list, and load the subtitle file, then adjust its parameters including Transparency, Vertical Position, Font, Color, Size, Style, Line Spacing. Go to the "Audio" panel. Click "Add Audio Track" button above the audio track list, and load the audio track you want. 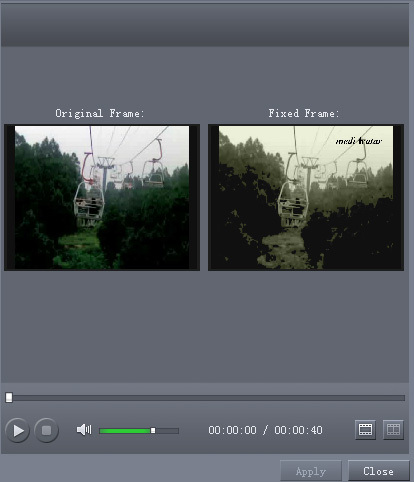 Go to the "Image" panel, on which you can adjust the brightness, contrast and saturation of the video image by dragging the sliders or entering the values. 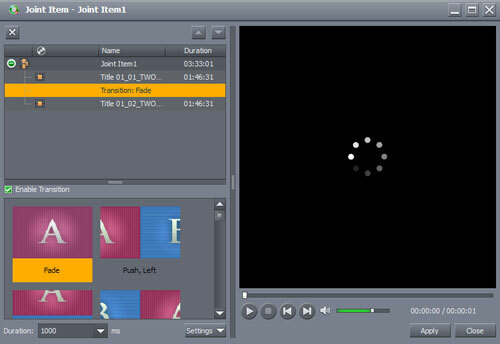 And add special effects to the video by enterring the "Effect" panel and checking the effects you want in the effect list. Finished effect adjusting? 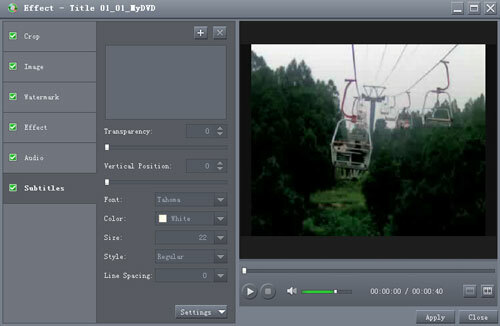 Now click "Comparing Preview" button at the right bottom of the player to preview the original and fixed image effect abreast, ensuring you get the right effect you want. After the above settings, click "Rip Checked Item(s)" button on the toolbar to start converting DVD titles! You can check the progress from the "Status" column in the file list and progress bar at the bottom. After ripping DVDs, click "Open" button to find the outputted movies. Okay, that's all! 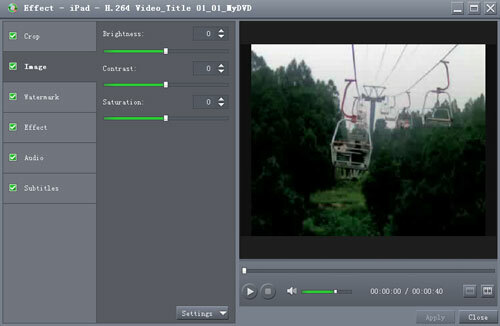 It has never been easier to rip DVD movies with mediAvatar DVD Converter! However, this DVD converter gives you more! Want to have a trial now? Go to this mediAvatar DVD Converter for free download to find more.